Looking for DIY embroidery material or Sabya-style saree borders? Want to add a lacy back to a dress? 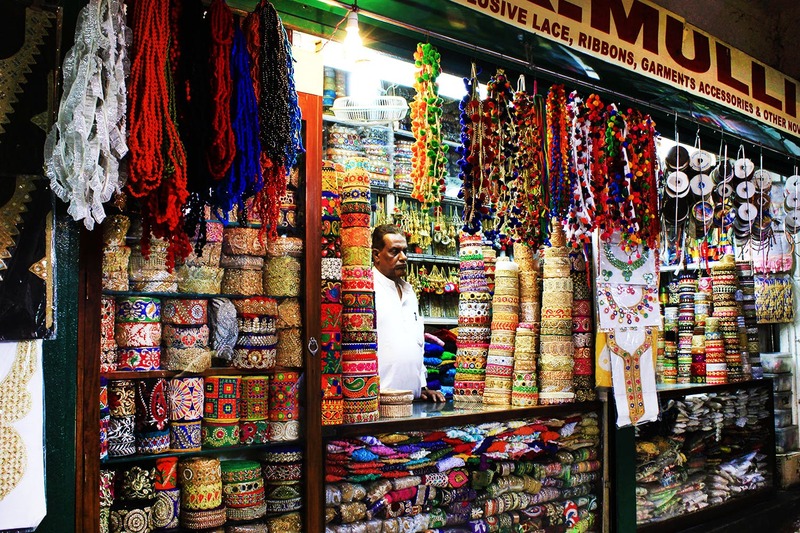 Head to these shops in New Market which are overflowing with the best embroidered borders, patches, and all kinds of beautiful lace. This shop is not in the corner of New Market with the other lace shops, it’s in a lane parallel to them. Lace nets that you can use for backless dresses, ‘latkans’ for fancy blouses, brocade and borders for sarees – there are a ton of things that you will find here. This shop has a very unusual collection of handpainted wooden buttons that you may want to pick up for a dress or kurta. Flower appliques are also something that you will find in abundance. The lace starts from INR 50 and goes up. Appliques are for INR 20- 40 for a pair. This is one of the oldest lace shops in New Market. They have heavy brocade work lace, perfect for weddings. You will also get latkans and buttons, but they specialise in lace. From cutpiece to pompom, you will find every kind of lace here. They even have a brochure for thread colours, so you can choose. Lace strips start from INR 200. Yup, most shops in that corner are called AR Mullick, but they are all independent shops. Here you can find buttons of all sizes and colours, thread catalogues and thread kits. We loved the crochet frames to make dreamcatchers (INR 200). Velvet laces anyone? This shop will help you find the things you need to quirk up your outfit. They also have a large variety of ‘latkans’, from the smallest to the largest size (INR 100-180), and chains that can be used as bag handles, buttons with embroidery, and even fur lace! Their laces are for INR 100-200 a metre. Appliques for your sarees and ethnic wear, yolk appliques to use for kurtas and anarkalis, crochet lace, brocade and cutpiece lacework – you will find all of these here. Their laces start from INR 40.